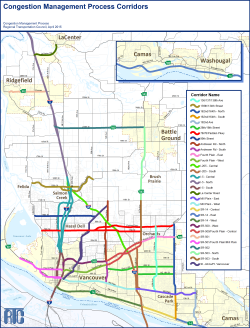 As the federally designated MPO for the Vancouver/Clark County region, RTC is required by federal law to maintain a CMP, which is a systematic process for managing congestion that provides information on transportation system performance and on alternative strategies to alleviate congestion and enhance the mobility of persons and goods. Quality of life and economic prosperity in the region depends on efficient mobility for both people and goods. There is recognition that strategic expansion of capacity is needed at key bottlenecks. Capacity expansion should take place after lower cost efforts have been made to improve the operations of existing facilities. 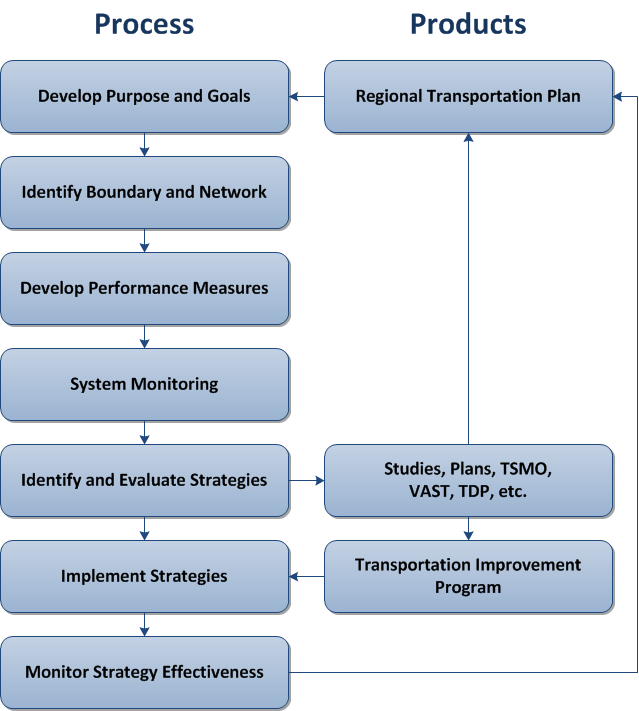 The CMP is intended to identify and manage congestion using performance measures to direct funding towards strategies that most effectively address congestion. The CMP is implemented as part of the overall metropolitan planning process. The overall CMP process is displayed in the figure above. Traffic congestion occurs where the volume of users on a facility exceeds the maximum number of vehicles a facility can accommodate. Traffic congestion is characterized by slower speeds, longer trip times, longer delay, travel time uncertainty, increased vehicular queueing, increased traffic collisions, and other congestion characteristics. One of the early steps in this process is to identify the network. By identifying a network, the region can focus its efforts on corridors that are most likely to experience congestion. 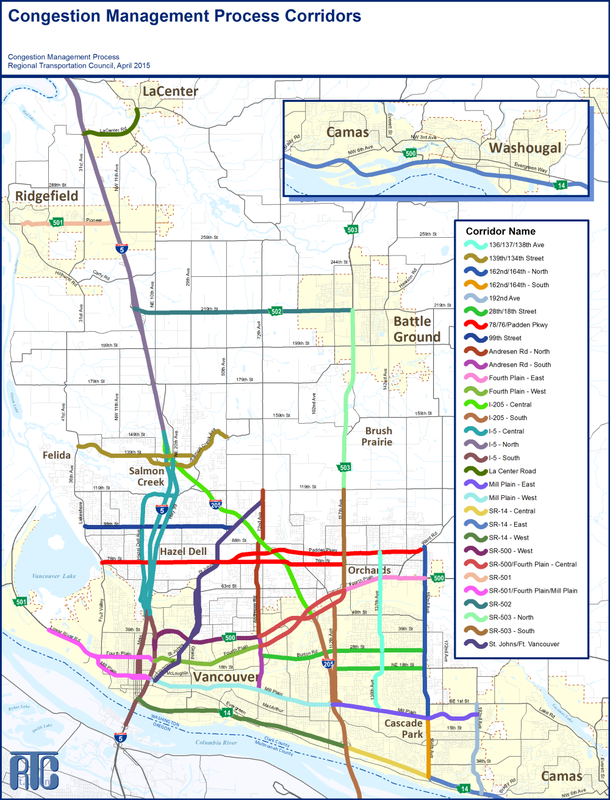 In our region the congestion management network includes major inter-regional and arterial corridors. These corridors form a subset of the Regional Transportation System, which includes thirty-one corridors, identified on the adjacent map. The monitoring element of the CMP is designed as an informational tool to be used within the decision-making process. 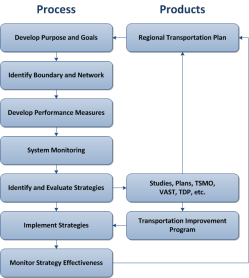 It is also intended to provide an understanding of the transportation system’s operating conditions and deficiencies and to assess the impacts of improvement strategies. Prior to 2012, the supporting data was contained in an appendix of the PDF report, rather than being separately downloadable as an Excel workbook.